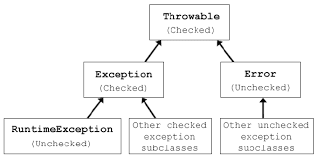 Checked exceptions are subclass’s of Exception excluding class RuntimeException and its subclasses. Checked Exceptions forces programmers to deal with the exception that may be thrown. Example: Arithmetic exception. When a checked exception occurs in a method, the method must either catch the exception and take the appropriate action, or pass the exception on to its caller.